The shape of the nose is determined by the ethmoid bone and the nasal septum. The shape of the nose is determined by the ethmoid bone and the nasal septum, which consists mostly of cartilage and separates the nostrils. The nose and paranasal sinuses are part of the upper respiratory tract. The functions of the nose include the sense of smell and conditioning of inhaled air by warming it and making it more humid. Hairs inside the nose prevent large particles from entering the lungs. Nasal mucosa and cilia help prevent pathogens and dust from reaching the lungs. Sneezing helps remove foreign particles that irritate the nasal mucosa. The paranasal sinuses are air-filled spaces around the nasal cavity that have many possible functions. The mucosa of the upper respiratory tract contain antimicrobial proteins that are a barrier component of the innate immune system. nostril: Either of the two orifices located on the nose (or on the beak of a bird); used as a passage for air and other gases to travel the nasal passages. paranasal sinuses: Four air-filled spaces around the nasal cavity that perform many functions, such as draining mucus from the nose. The nose and paranasal sinuses form much of the upper respiratory tract, along with the pharynx. The upper respiratory tract is the entrance to the respiratory system, where air first enters the body. The overall function of the upper respiratory tract is to provide a pathway for air to reach the lower respiratory tract, where gas exchange occurs. Internal diagram of the human nose: Air flows in through the nasal passage on the right and out through the nasopharynx on the posterior side. The external part of the human nose is the protruding part of the face that bears the nostrils. The shape of the nose is determined by the ethmoid bone and the nasal septum. The ethmoid bone is the bone that separates the nose from the brain, and supports the shape and structure of the nasal and orbital cavities. The nasal septum is wall of cartilage that separates the right and left nostril chambers from each other. On average, the nose of a male is larger than that of a female, due to differences in facial bone structure between genders. 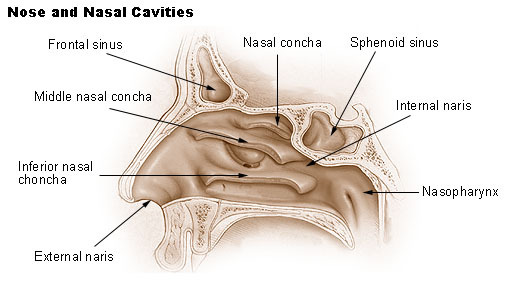 The interior of the nasal cavity is lined with mucous membranes, nasal hairs, and cilia (microscopic hairs), that perform many of the specialized functions of the nose. The macroscopic nasal hairs prevent large particles from reaching the lungs, while the cilia and mucus trap pathogens and dust to take them to the pharynx, where they can be destroyed by digestion. Another function of the nose is the conditioning of inhaled air, warming it and making it more humid. Sneezing occurs from irritation of the nasal mucus, which expels foreign particles, but can also spread microbial and viral infections between humans. Finally, the nose has an area of specialized cells that are responsible for smelling, which is considered a nervous system function rather than a respiratory system function. The paranasal sinuses are a group of four, paired, air-filled spaces, lined with respiratory epithelium (ciliated columnar epithelium). These are named according to the bones within which the sinuses lie: surrounding the nasal cavity (maxillary sinuses), above the eyes (frontal sinuses), between the eyes (ethmoid sinuses), and behind the ethmoid bone (sphenoid sinuses). Locations of the paranasal sinuses: The paranasal sinuses are four airspaces around the nasal cavity. The functions of the sinuses are not fully understood, but there are many possible functions. The most important function is the sinuses’ role in draining mucus from the nasal cavity to the nasopharynx, which helps regulate pressure inside the nasal cavity. This may be a component of the barrier defenses of the innate immune system because of antimicrobial proteins found in the mucosa. Other possible sinus functions include giving resonance to the voice, supporting the structure of the skull and facial bones, heating and humidifying inhaled air, and protecting the face from injury.